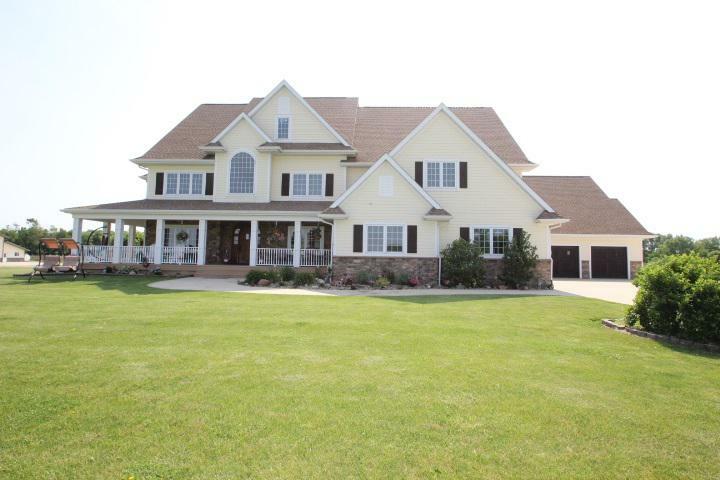 Stunning home on 53.4 acres m/l. Home has over 10, 000 sq ft with 7 bedrooms, 6 baths, theater room, wine cellar with tasting room, exercise room, large family room down and 4 seasons porch over looking the terraced gardens and courtyard! Kitchen boast of upscale amenities Subzero stove and built in refrigerator & built in drawers for drinks. Island has seating, built in cabinetry is custom made, with custom made bench built in for seating. Attached garage has over 2, 600 sq ft with access to large mud room with built in cabinetry and laundry room main floor. Master suite on main floor with bath , closet and access to office on main floor. Also there is a 2nd master suite on the 2nd floor of the home as well. Pole building has cement floors and a leanto for cattle on the east side. Fenced pasture and dry lot for cattle.